Prior to painting walls or flat ceilings you should check for any large damage and repair it. However, there is always damage that appears (be it because of other tradesmen banging up the walls or because the light changes the surface after the prime coat goes on). The process we use is to do major repairs (large broken tape joints, larger holes, eye level damage) the put the 1st coat on. After the first coat we pole sand the entire surface and light check it for smaller damage. Basically every surface gets a double check. Heres a ceiling in Woodbury where we scraped down the popcorn texture and repaired some major damage (a total of 6 broken tape joints). Then we skim coated the entire ceiling and primed with a flat ceiling primer. After the prime process we light checked the entire surface for smaller prep. After the smaller prep was repaired we put two coats of flat ceiling paint. Turned out great. Here is Jason after the primer doing the additional light check and ceiling repair. Complete Custom Painting performed an interior staining and enameling project in Stillwater, MN for a homeowner who was building a unique barn. 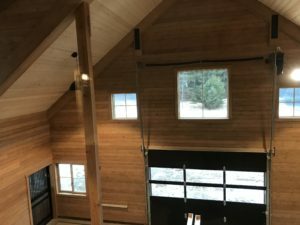 The barn included 2×6 fur walls, a pine ceiling, maple trim, oak doors and oak cabinetry. Walls were primed and painted with Sherwin Williams Cashmere. This job took a few months given the complexities of the carpentry work but it was worth it. The most elaborate barn I’ve ever seen! 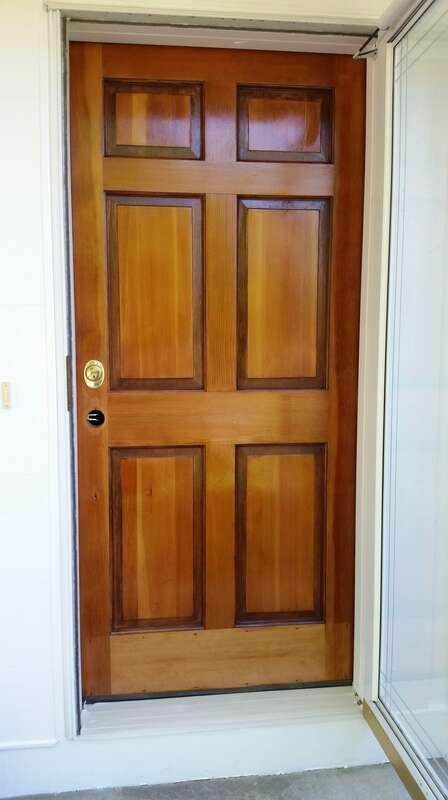 If you are having new wood work stained (windows, doors, cabinets, trim etc etc) you should consider doing a lot of stain matching before starting. In the case of windows (which is a common item homeowners have replaced in their homes) consider most wood windows are made of pine/fur. 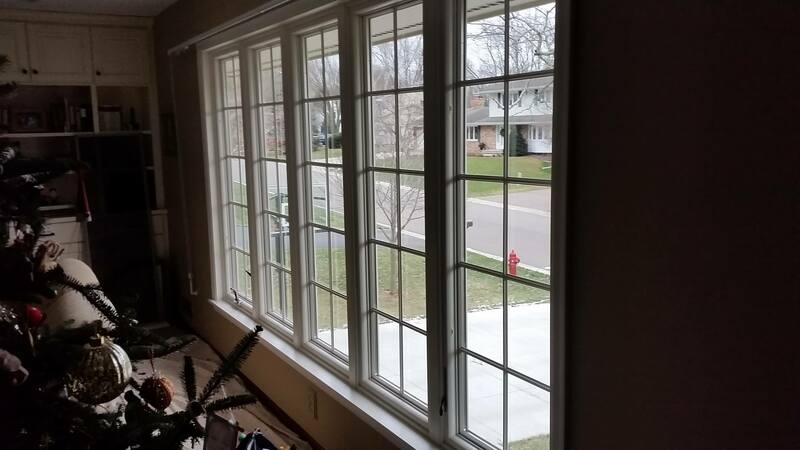 Their are window companies that install oak/maple windows also but the primary window wood is pine/fur. The portions of the windows that are pine/fur are normally the sash and the jamb. The sash on the window is the part that moves (goes up and down in the case of a double hung window/side to side in the case of a glider window/or in and out in the case of a casement window……). The sash could also be described as the part that is direct contact with the glass. The jamb on the window is the part that sits in the framing pocket. Normally the jamb is between 2 and 6 inches wide and conects to the casing. The casing is normally the part of the window that shares the same species of woood as the rest of the house. Sooooo- A typical house will have Oak baseboard, doors, door frames cabinetry etc etc but the jamb and sash on the same houses windows will most likely be pine/fur. 2 differnt woods. Here is a job where we matched some custom bathroom windows to the cherry casing in the house. The windows had a maple hardwood/pine hardwood and maple veneer and needed to match the casing in the rest of the house. When homeowners update their homes, they often consider going from a popcorn texture to a smooth or knocked down texture. A simple step to determine how much work is involved is to test how the existing texture will come down (easily or hard). To test the ceiling surface you need to protect all surfaces in danger of spillage. Wet the ceiling, let the water dwell on the surface and then scrape down the existing texture. At that point you will be able to tell how easily the existing texture will come down. In some cases, the popcorn texture will come down easily and in some cases it will be very difficult. In cases where it comes down easily, the homeowner may have the option to go to a flat/smooth ceiling for the same price as a knock down. 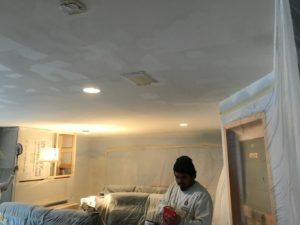 In cases where it does not come down easily (generally this happens if the popcorn has been painted several times or was primed with oil or shellac) the ceiling will likely need a lot of skim coating. The reason its important to test the existing texture is to ensure the company that intends to do the work (as well as the homeowners who are paying for the work) know what to expect with regard to the project: days to complete the project, what to expect as far as staging, cleaning requirements, texture options and also the correct price for the job. 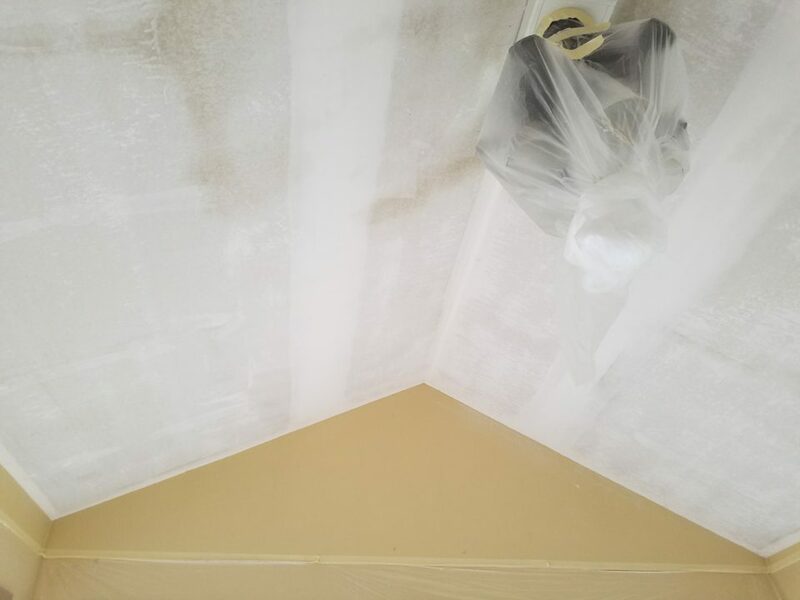 Complete Custom Painting did the pictured popcorn texture removal job in 2018 in Mahtomedi, MN The homeowner went from a popcorn texture to smooth ceiling. 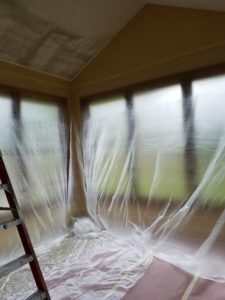 Since we were also painting the walls, we taped to protect the windows and floor and simply cleaned the walls prior to painting (which we would have done anyway). The prep work was clean as we set out painters plastic angled to drop all wet texture on top of another piece of plastic. The homeowners wood floor was clean of all dust and we texture. It turned out great and was completed in 3 visits. Day 1: Wet and Scrape down the popcorn texture. Day 2 prime the ceiling and skim tape joints where needed at end of the day. Day 3 Sand mud, spot prime mud, fully paint the ceiling (2 coats), clean up. 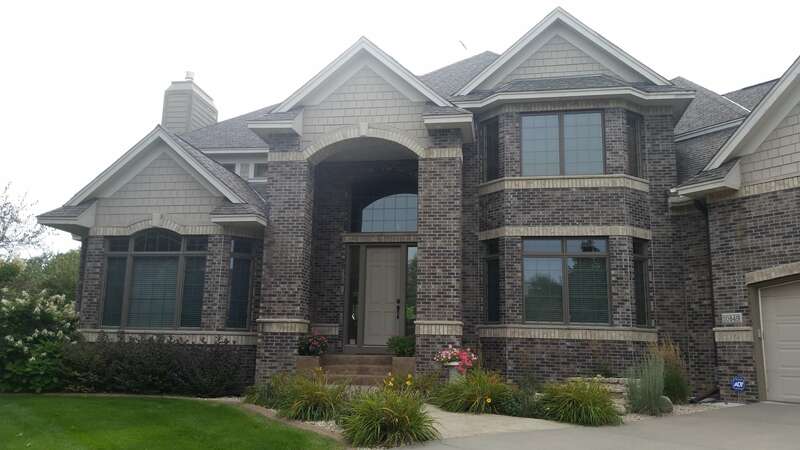 Complete Custom Painting is a Twin Cities based painting company that does interior and exterior painting and staining. On this job we mixed two types of stains, one for the pine and one for the oak and we painted all the ceilings and walls. Excellent service and care of the homeowners property was needed as the floors were just finished. The products that were used were water-based stain, Zero VOC Wall and ceiling paint and water based polyurethane. 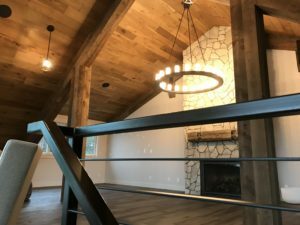 Complete Custom Painting offers interior and exterior residential and commercial painting in the Twin Cities, Metro Area. This job was in North Oaks. 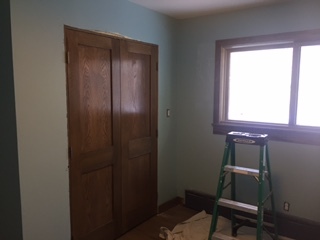 Contact Complete Custom Painting 651-336-0561 for a free estimate. 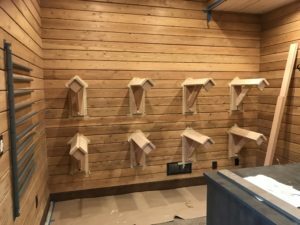 Complete Custom Painting is a Twin Cities based Painting Company that does interior and exterior painting and staining. On this job 2 painters were tasked with matching an existing deep based Cherry stain and matching an enameled fireplace mantle to several new windows. The process involved enameling with Benjamin Moore Satin Impervo and staining with General Finishes Staining Products. All products were water-based because we are conscience of homeowners health needs. In addition, we did a through walk through in order to make sure the customer was extremely happy with the end result. Quality is the most imporatant aspect of our job, and service is extremley important to make sure all of the customers needs are met. 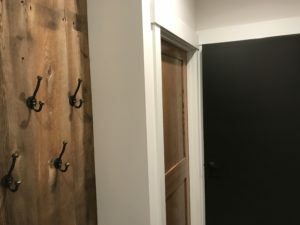 Call Complete Custom Painting (Located in White Bear Lake, MN) a Twin Cities based Interior and Exterior Painting Company for any Painting Needs. 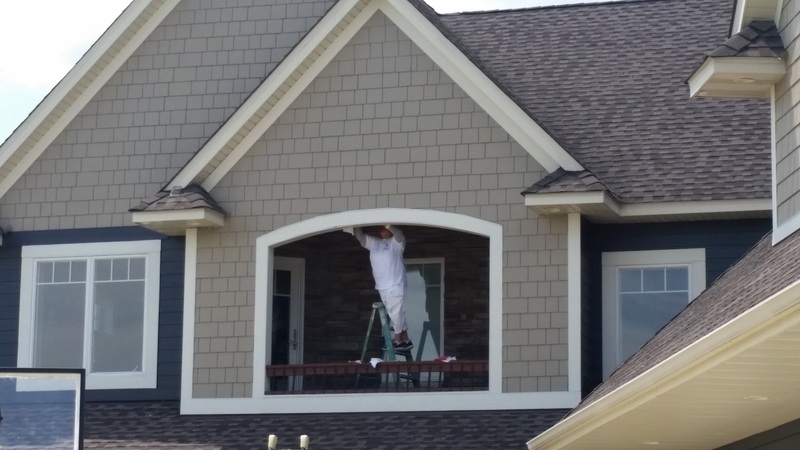 Complete Custom Painting closed out the exterior painting season in 2016 with several projects. 1 in the Liberty Neighborhood in Stillwater, 1 in the Dancing Water Neighborhood in Woodbury and 1 in Eagan. 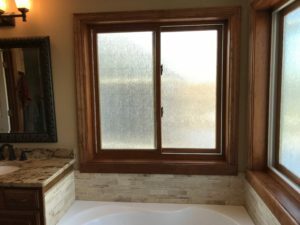 The projects consisted of wood prep/staining (Eagan), Sealing Hardie Plant and top coating with 2 coats as well as sealing brick (Woodbury) and matching with one coat in Stillwater. All surfaces required a different approach. The color of the surfaces affected the decision on the quality of product, if a primer should be used, how many coats should be used etc etc. At complete custom painting it is our goal to be consultive and give you the very best paint job for your given objective. 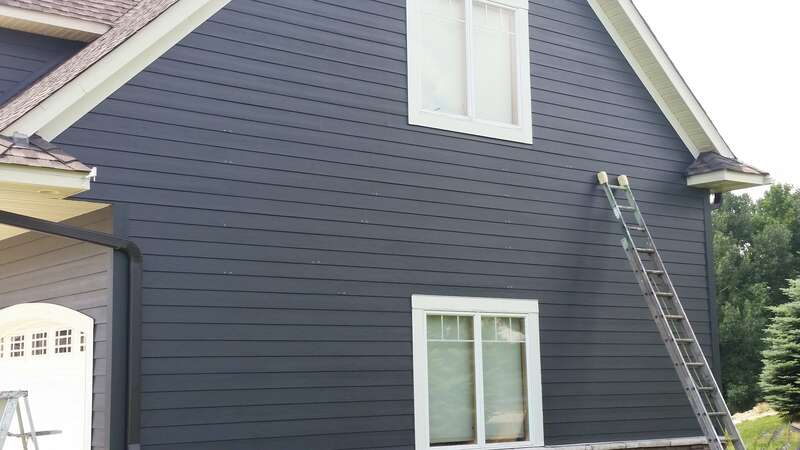 In one of the projects the homeowner had a deep base color and planned to live in the house “forever.” for another project, the homeowner only wanted to “spruce up for a few years” because they were considering siding replacement for certain areas. When considering exterior house painting, consider your goals for longevity, talk to a designer (its free) and use a quality exterior house painting company like Complete Custom Painting. 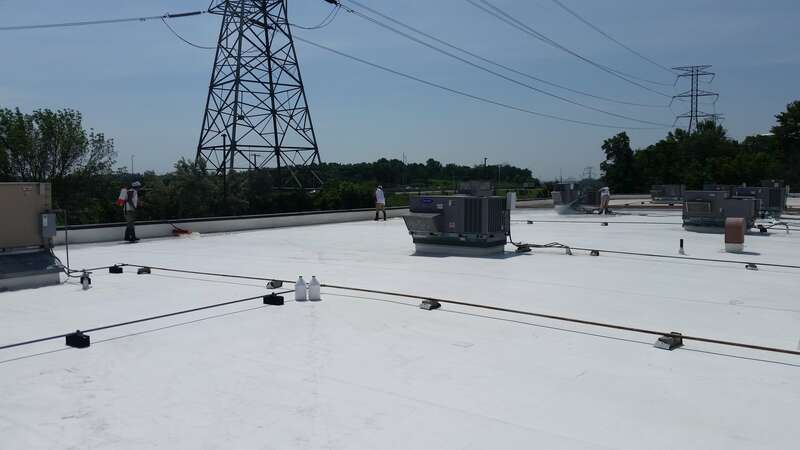 To maintain the warranty on white vinyl roofs they need to be maintained. They all collect dirt, mildew, suite and various other types of debris. They need patching occasionally and washing also. An important aspect for cleaning them is to avoid using a harsh chemical that would potentially etch or modify the composition or the surface. The correct process is to use a detergent that won’t harm the surface and wash the surface so as not to damage it. On this commercial vinyl roof in Minnetonka, MN we used a gentle, environmetally friendly detergent, scrubbed it gently then washed it with a Hot Water Washer. A big advantage to acheieving a cleaner roof is Hot water. Hot water cleans everything better so the owner of the building got a better job in the same amount of time and at the same price than had a company used cold water. When you need the exterior of your Hardie Plank house painted, your deck stained, your front door re-finished and a few interior walls painted, No need to call multiple vendors. An experienced painting company should be able to manage and handle it all. At this house in the Woodbury/ Lake Elmo area that started out as an exterior painting job, we primed and painted the exterior hard board siding, stained the homeowners deck, painted several interior walls and applied a couple coats of spar varnish to the bead board ceiling. Additionally, the homeowners siding was coming loose in seveal areas. We took the time to point it out and screw down the boards on the studs. We used stainless stell screws to avoid future rust bleed.